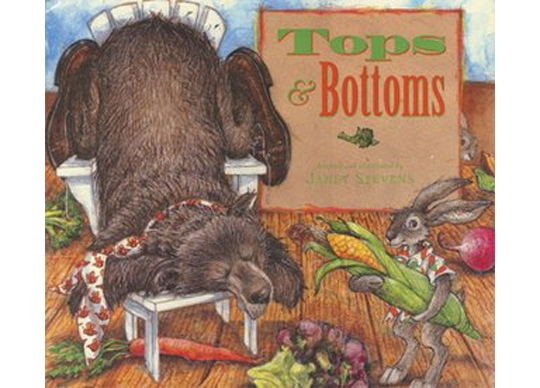 This week first graders heard Janet Steven’s Tops and Bottoms about a crafty hare and a lazy bear. This is one of those great picture books that is not only beautifully illustrated, and has an unusual format (the books is read by holding it lengthwise), but it teaches a concept in a most enjoyable way. Top, middle, and bottom might not be the most exciting subject for little ones but after hearing this hilarious tale they know the difference. In addition, they learn a little about profit, the dangers of accepting a deal that seems to good to be true, and the value of hard work. All wrapped up in one enjoyable story! Kindergarten–What would happen in the signs we take for granted disappeared and in their place were strange directions or downright silly ones? This is the premise for Tedd Arnold’s charming story, The Signmaker’s Assistant. Norman, the assistant, decides to change the signs around town and has a lot of fun watching people follow his silly directions until things get out of hand and chaos ensues. The gentle reminder is that we should think before we always follow a sign. Second Grade, Third Grade & Fourth Grade–Each class played a version of “Name That Book!” to learn about the different types of reference books in our Library. We discussed the fact that these books were (sadly) becoming “dinosaurs” with the advent of the internet but that going to sites owned by the publishers of these types of books would be a good idea. That would save checking for authority and accuracy in websites. Fifth Grade–Fifth graders played a rousing game of Library Jeopardy this week. Sixth Grade–Sixth graders finished their text for their blog posting about their god or goddess.